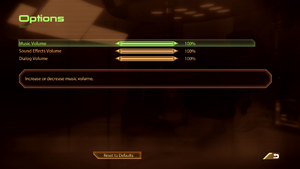 Saves can be imported from Mass Effect (see Import Mass Effect saves). Does not include all DLC expansions. For some time now Origin will overwrite any installation of the game, including Steam, with a stand alone client independent version of the game with all bought DLCs. Autorization for the DLCs still is dependent of ingame login but it'll work without Origin or Steam. All of the DLC is available in a bundle on Origin. Patch 1.02 is a cumulative update. The Origin/Steam versions are already patched. A Lot of Textures is a re-texture community project that brings extra details for the game, replacing around 1200 textures with high-resolution variants. Coalesced.ini must be edited with a specific process due to the special format required (see Editing Coalesced.ini). 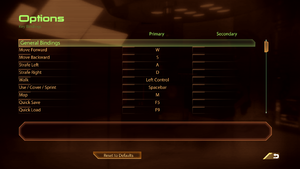 For the folders used for importing saves see Mass Effect. DLC files are saved in <path-to-game>\BioGame\DLC\; an explanation of the folder names and which DLC they represent can be found here. The save importer may not work. 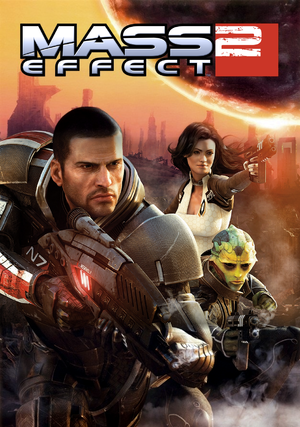 In this case, move your Mass Effect saves into an ME1 folder inside your ME2 saves folder. Move the save file to the USB using the Xbox 360. Move the USB to your PC. Open the save with Modio. Upload the save here and download the processed file. Move the downloaded save to the appropriate folder. Use Flawless Widescreen (±20) For higher values see Field of view (FOV). Can be changed in MassEffect2Config.exe. Can be forced through graphics driver. This method involves Coalesced.ini file. Make sure you have understood what this means. Edit the key name and FOV value to your liking. 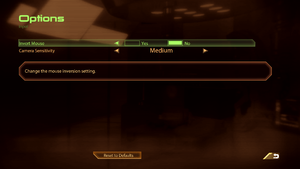 Can be used in conjunction with Flawless Widescreen providing "FOV Limiting" is disabled. You also need to disable Vsync for this to work (see Vertical sync (Vsync)). Enabled by default; see Mouse acceleration. This may not work with the Origin version. If this is the case, make these changes in Coalesced.ini (see Editing Coalesced.ini). This mod brings full XInput controller support to the game with haptic feedback support. This mod is currently complete (see official thread). Found under Gameplay settings in-game. Fan translation for DLCs, download. Fan Patch for DLCs, available here. Open sku.ini, then set the following fields to the desired values. The possible values are INT, FRA, ITA, ESN. The languages other than english (INT) must have been installed in order to work. At the end of the taxi chase with Liara on Illium, during the cutscene, the game freezes completely showing either a frozen image or a black screen while the music continues. Insert Disc 1 and share it through Windows. When the installer asks for the second drive, stop sharing the first disc, replace it with the second and start sharing it. Find the Path variable on the right and double click it to open for editing. Add a backslash (\) to the end of the path string and hit OK. The game should now launch from Origin. Go to http://www.nvidia.com/object/physx-9.13.0604-legacy-driver.html and Download the drivers. Install Nvidia Physx Legacy System Software. Run Mass Effect 2 again. Go to Windows's Control Panel. Go to Programs -> Turn Windows features on or off. In the tree stucture, check both boxes under Microsoft .NET Framework 3.5.1. Go to the MassEffect2.exe file. It's in the .../Mass Effect2/Binaries folder. Create a shortcut to the MassEffect2.exe file. Right click the shortcut, and click 'Properties'. On the Origin version of the game, the name of the file you need to create the shortcut for is "ME2Game.exe", so the shortcut should look like this: "...\Origin Games\Mass Effect 2\Binaries\ME2Game.exe" -nomoviestartup. Holding the NUMPAD + key in-game will now make you noclip until you release the button. 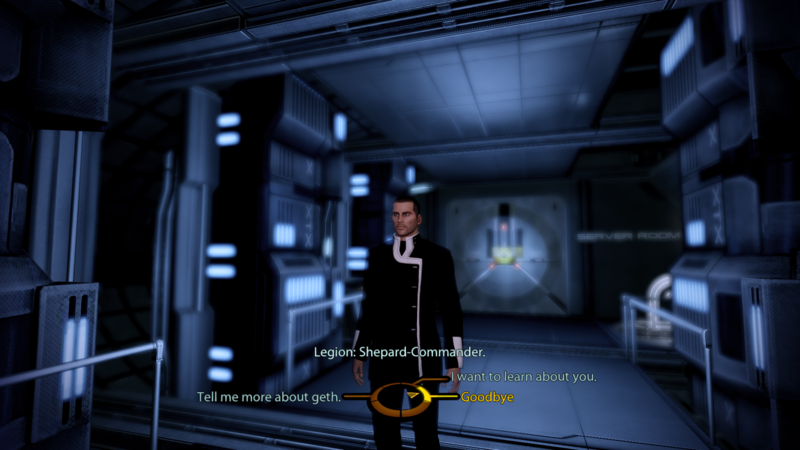 Walking through the ground level corridor, that connects to the other side of the map, under Liara's office may cause a black screen and CTD. After passing through the corridor, it's safe to enable fullscreen mode again. In some cases simply walking through the hallway avoids freezing. With this method you can leave fullscreen on. 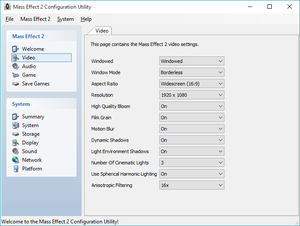 If automatic Mass Effect 2 directory detection fails, manually select it. Click the "Run Game" button. Download ME2 Gibbed modified Save Editor (mirror). Run it and open your actual savegame. Go to Plot tab and then to ME1 Imported plot table. Go to Flags sub-tab and untick [Conrad] (3) Intimidated Conrad (Renegade). This only works if the player has not spoken with the Asari bar owner in Illium yet. Block internet connection of ME2game.exe through your firewall settings. Optionally you can disable automatic login through in-game settings although any time the game does attempt to connect it'll reverse the DLC crack. Some of the fixes for this game require you to modify this special file, but editing it in the normal way will cause the game to crash. Do not use default Windows Notepad or Word. They will permanently corrupt your ini file. It might be necessary to make the Coalesced.ini file read-only (right-click -> Properties -> Attributes: Read-only) as the game can restore your edits. If you want to change anything in it, simply uncheck the Read-only box. 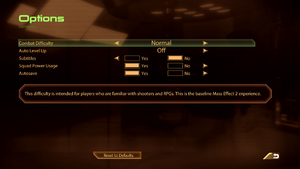 Some of the post-processing effects can be disabled in the game's GamerSettings.ini file. These effects include light bloom, and motion blur. A longer list of options that can be added and altered under [SystemSettings] can be found here. ↑ 2.0 2.1 File/folder structure within this directory reflects the path(s) listed for Windows and/or Steam game data (use Wine regedit to access Windows registry paths). Games with Steam Cloud support may store data in ~/.steam/steam/userdata/<user-id>/24980/ in addition to or instead of this directory. The app ID (24980) may differ in some cases. Treat backslashes as forward slashes. See the glossary page for details. This page was last edited on 18 April 2019, at 19:10.